‘Flying Foxes’ is to be launched on July 25th 2015 as part of the Michael McGirr series of digital long stories. ‘The Michael McGirr series’ stories may be purchased individually, when available, or as a set. Click here for details. See best-selling author Michael McGirr’s bio here. The series is being launched by the fabulous Walter Mason writer, spiritual tourist, lifelong dilettante and author of Destination Saigon and Destination Cambodia. 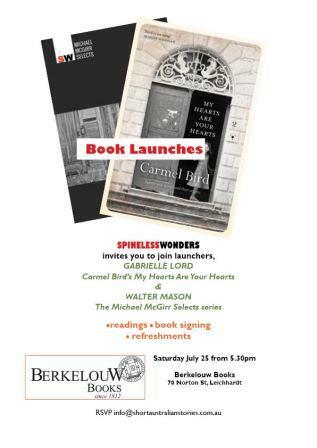 As well, Carmel Bird’s new short story collection, My hearts are your hearts, will be launched on the night by queen of Australian fiction Gabrielle Lord. Read an interview with Carmel Bird at a bigger, brighter world blog here. The 12 stories in the series were finalists in the Carmel Bird Long Story award, and includes ‘We’re all Travellors Here’ by award winner Marjorie Lewis-Jones. Should be a good launch! Come along from 5.30pm and enjoy readings, book signings, refreshments and meet the authors. RSVP: info@australianshortstories.com.au. This entry was posted in Uncategorized on June 20, 2015 by Jane Skelton.